Scully: Imagine all a woman’s hopes and dreams for her child and then nature turns so cruel. What must a mother go through? Mulder: Apparently not much in this case if she just threw it out with the trash. Scully: I, I guess I was just projecting on myself. The episode’s theme was already one of family ties and the acceptance or rejection of difference — but the reference to trash reinforced the connection with Home Again even more. Morgan purposefully recreated that scene with Mulder and Scully sitting on a bench. Never Again does not address Scully’s feelings towards motherhood, but it does explore her own feelings towards her personal relations, career and life achievements, in one of the most memorable episodes of the show (with Jodie Foster voicing Rodney Rowland’s tattoo). Second, “home again” is where the homeless people are supposed to be relocated to, to find the home they had lost. Thirdly, the title would make much more sense as the revival’s second episode, Mulder and Scully back home as agents in the FBI. The episodes airing order was changed shortly before airing, a decision made by Carter; Morgan is quite frank when he says that he doesn’t approve: “I’m not a fan of moving them. I had to cut some things.” What we know was cut was Mulder and Scully’s reply to the detective, “They said that you two have experience with these, um, spooky cases” — we only get a grimace from the tow agents instead of them replying “We used to“. A very short thing to cut, and an odd decision given that this particular line was used heavily in the promotion material of the revival. This line would have worked in the context of this episode as well, this might be their third case since their return but it’s not old news either. Now that we have seen more of the revival, we can have a better idea of whether this reordering was justified or not. Home Again does strike several notes that make it feel like a second episode: the introduction of Mulder and Scully through their badges, their banter on “back in the day“. Also, it feels like the agents (the actors?) are learning to work together again in this episode, and Mulder still feels down, which would fit better in an episode coming right after My Struggle and before they hit their stride again in Were-monster. However, there is no Skinner in this episode either and we do not see the X-Files office: Skinner’s “welcome back” in Founder’s Mutation makes that episode work as a second as well. 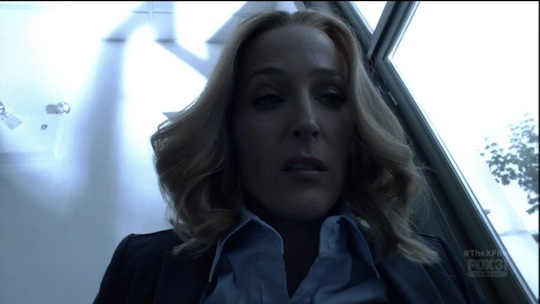 Glen Morgan argued that this episode was sowing the seeds that Founder’s Mutation would reap: reference William and make us wonder whether Mulder was thinking about him or not, and reveal in the later episode through his daydreams that indeed he was. With the episodes reversed there is no real contradiction, but we do get a Mulder that is more distant vis-à-vis Scully, and more tight-lipped. 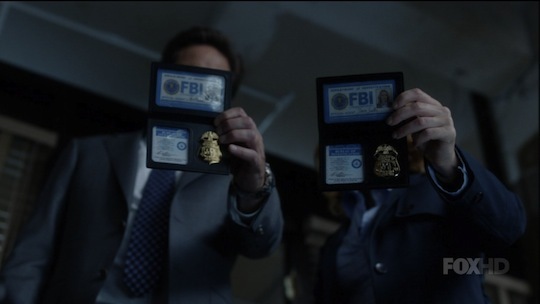 The episodes were probably reordered in order to have Founder’s Mutation, an episode with more investigation and more pro-active agents, come as the second part of the two-night premiere, instead of having the heavy drama and darkness of Home Again that could have been too much for some viewers after the depressed Mulder and bleak Scully of My Struggle. Like Founder’s Mutation, this episode strikes a lot of notes of the classic monster-of-the-week episode: the investigation of a crime scene, analyzing evidence at a crime lab, the insistence on showing them exploring dark spaces with flashlights (forming an “X”! ), acts ending with another murder, and a good old dose of gore. The teaser and all of Band-Aid Nose Man’s appearances are masterfully done, with joyous bursts of splatter that horror aficionados will appreciate; Band-Aid Nose Man’s lonely appearances in a dark urban landscape are reminiscent of Candyman (Bernard Rose, 1992), a classic in its genre. Morgan also makes use of the “murder with offbeat old pop song” technique that he and Wong made use of quite a bit: in 4X03: Home of course (Johnny Mathis’ “Wonderful, Wonderful”) but also Millennium‘s 2×10: Goodbye Charlie or 2×22: The Fourth Horseman. 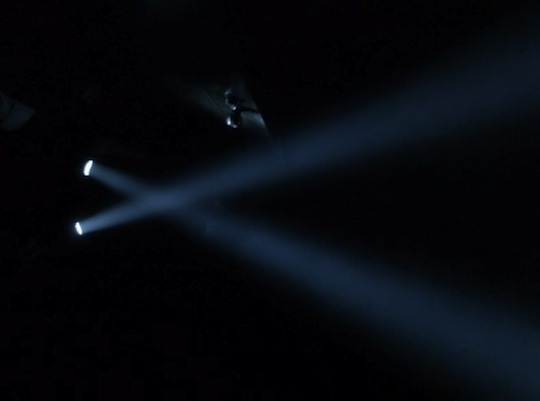 The X-Files used this several other times (5X10: Chinga, 5X11: Kill Switch) and its has become something used in many other pieces of work (Tarantino films, The Sopranos, American Psycho…). The use of the oldie “Downtown” by Petula Clark (1964), with lyrics such as “You can forget all your troubles, forget all your cares, So go downtown“, is a perfect fit for a revenge murder from poor downtown to rich suburbia! The case here brings us to look closer at the issue of the homeless. If My Struggle updated us on the New World Order / Elites conspiracies that have blossomed post-9/11, Home Again chooses to give a voice to the left behind of the on-going economic crisis of 2008 that has increased inequality and evictions to unprecedented levels — one could say the focus is on the left behind of the plans of the aforementioned conspiratorial elites. As Scully says, Mulder’s quest is for answers to the “big questions” of life, the universe and everything, to uncover big supra-human conspiracies — this episode more focused on Scully brings to our attention the other side of the coin, the human victims of such plans, victims that we cross our paths every day but scarcely pay attention to until you become one of them. With this episode, Morgan firmly brings The X-Files to topical social issues — I cannot think of any US television series treating this oft-neglected issue apart from My So-Called Life (1994) or The Wire season 5 (2007)! — however this is more of a springboard for the story than preaching a specific point of view. The case looks at homeless in the city of Philadelphia (which, as Mulder quips, aptly means “brotherly love” in Greek!) and efforts from the US Department of Housing and Urban Development to relocate them. The HUD is responsible to provide affordable homes to all, by building social housing and by managing real estate. The homeless are seen as a material problem that needs a material solution, trapped in a turf war between people who are taking care of this problem in their stead, when those people are only looking to move the problem as far away from them as possible. One is a representative of HUD, who wants the homeless to move out in order for the area to be redeveloped and gentrified; the other is a “concerned citizen” that doesn’t want the homeless to be relocated closer to her home and her family. Other people with selfish motives are the art dealers who see street art, which is born out of the creativity of the multitudes of the streets, as a way for them to get richer and not to promote these artists. What is original here is premeditation: the fact that Trashman did not send Band-Aid Nose Man on a killing spree — he was simply conceived and created. The murders were the result of an unconscious urge, a zeitgeist of turning tide of oppressed against oppressor. The creation has escaped from the control of the creator and now lives a life of its own. The end suggests that, despite Trashman’s efforts to turn destructive feelings into positive feelings (the smiley face on the sculpture), the stencils seem to be appearing independently of Trashman. The emotional core is of course Scully and her dealing with her mother’s last moments. Morgan and Wong were responsible for the creation of the Scully family. We met Margaret Scully with the death of Dana’s father William Sr. in 1X12: Beyond the Sea; we met Dana’s sister Melissa in 2X08: One Breath. 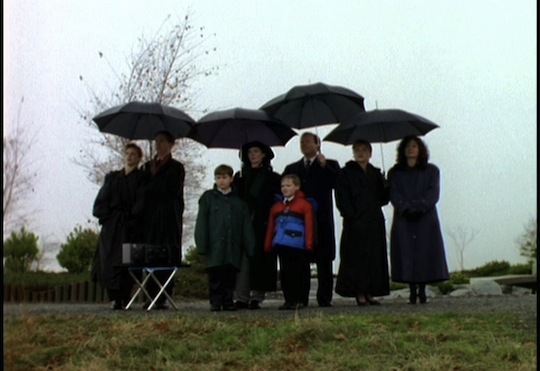 We later meet Bill Scully Jr, who became a father in 5X07: Emily, but never got to meet the mysterious Charlie Scully. And so after Scully’s father in Beyond the Sea, after Mulder’s parents in 2X25: Anasazi and 7X10: Sein und Zeit, it was time for Scully’s mother Margaret to pass away. Some great editing and camera work focused on Scully’s anguished face when Scully learns the news magnificently conveys her state of mind. It is also an opportunity to reflect on the past and on the path walked by Scully. The episode recalls extensively 2X08: One Breath, where Scully was in a coma and Mulder and Maggie were on her bedside and trying to “wish someone back to life” — there are even flashbacks to the episode. Mark Snow’s calmer music in the sentimental scenes is reminiscent of that in Founder’s Mutation, a nice touch of continuity; it also uses some violin instrumentation, reminiscent of the sound of Millennium. We meet a Dr. Colquitt, which shares a name with the CSM’s pen name in Morgan and Wong’s 4X07: Musing of a Cigarette-Smoking Man! The episodes surprises with Maggie referencing William. The delivery of Maggie’s last words, “My son is named William, too“, is as gut-wrenching as it is unexpected. Maggie called for Charlie not because she did not want Dana or Bill by her side, she knew Dana and Bill well enough; but in her last moments she wants to know that all of her children are doing fine so that she can pass on peacefully. By referencing William, she reignites Dana’s pain and puts on her mind the weight of responsibility for making sure that her son is well. In the fifteen years or so since Dana had to give William for adoption, the remorse and the regrets are wounds that hardly have had time to heal; Dana had barely managed to move on with her life without forgetting William, and her mother’s last dying words put all the repressed suffering back to the surface. Interesting that both Morgan and Wong have found interest in the storyline of William, one they did not participate at all in creating. Of course they identified the great potential at drama in the William storyline when they approached the series again after leaving it in season 4. That these old-time writers center both their episodes around the strong emotion of regret over past choices is somewhat ironic, given how much Carter has been the one accused of handling Scully’s motherhood storyline badly in seasons 8-9 by a considerable share of the fandom. 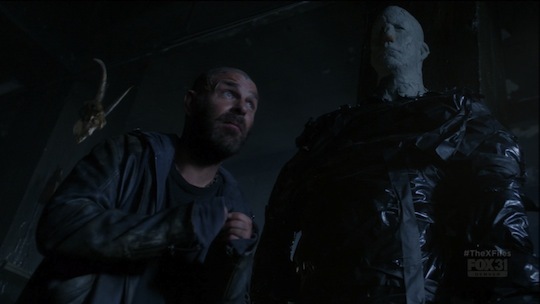 With references to him in three episodes out of four, William really is the connecting tissue that runs through the revival. But, by making him such an important part of the characters’ emotional makeup — instead of plainly forgetting him, which would have been another option after the forgetful way season 9 developed — these episodes become setup and they create expectations for a resolution. Will My Struggle II deliver on that promise? Will a season 11? Will Carter allow anything else but the series’ grand finale to show a reunion between parents and son? Morgan does attempt to link the two storylines together, making parallels between Trashman’s artistic creation that took a life of its own and Scully giving birth to William, and also having Scully wonder whether she threw away William as if he were trash. The parallels do make sense, however they feel somewhat forced in order to join the episode’s two disjointed halves. The episode also makes use of several flashbacks to previous episodes — 2X08: One Breath, but also William’s birth in 8X21: Existence and Scully worrying about William in 9X02: Nothing Important Happened Today II. This is somewhat of a cheap trick, it is there for the newer fans; The X-Files hardly ever used flashbacks, and this episode is somewhat diminished with them. The extensive use of flashbacks was also something I found problematic in the two previous episodes as well. 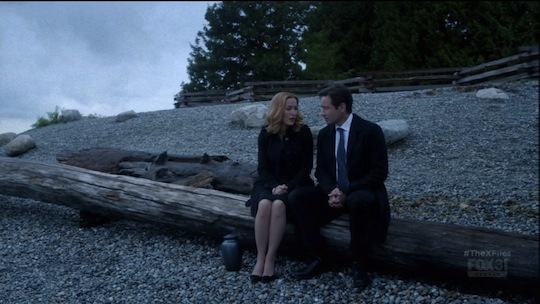 The concluding scene, where Scully and Mulder are on a log, there to spread Maggie’s ashes, is most likely the same place as where Scully’s father’s burial took place in 1X12: Beyond the Sea (a location The X-Files used extensively throughout its run, e.g. 1X03: Conduit or 3X22: Quagmire; same goes with the hospital where the homeless were relocated to, a location used in a great many episodes and in I Want To Believe). Out of all people in her life, Mulder is indeed there for Scully — justice through the ages when Bill Jr was accusing him of being absent during Scully’s cancer in 4X24: Gethsemane! Mulder is literally a shoulder for Scully to cry on — but he does not express sympathy beyond a sad face and he has not a single line. This episode is certainly a showcase for Gillian Anderson, but I would have liked to see Mulder be more overtly express himself and his caring for her. Despite some serious issues in pacing, which are really due to the fact that the writers want to give viewers the most story as possible despite a very limited number of episodes, Home Again is a very strong emotional journey on top of an excellent monster murder thriller with social commentary, perhaps the revival’s best episode! Ultimately, the entire revival’s problems might boil down to nothing more than trying to cram too much story in too little airtime, and not to bad writing or production. They want the episodes to be more than just plot, and that is perhaps a tribute to the writers’ and producers’ care and love for the central characters. This entry was posted on Saturday, February 13th, 2016 at 10:21 pm	and is filed under Case File. You can follow any responses to this entry through the RSS 2.0 feed. You can leave a response, or trackback from your own site. I really liked this one as well. It is interesting you point out the change in the airing order. Home Again leaves you wondering, what does Mulder think about the decision to put William up for adoption? Founder’s Mutation would have answered that with some sense of closure. It is ironic that Carter reversed the order since he seems to have ignored William in My Struggle. By reversing the order, it makes the William storyline more profound and requires that My Struggle II address it. I’m afraid that Founders Mutation was intended to address that storyline in the original ordering (and it would have fairly successfully). Now, like you, I get the sense that the storyline needs more resolution, but with the only remaining episodes being Carters I doubt we will have any. Indeed, the original order makes sense. But regardless, just talking about William raises expectations that eventually they will try to look for him somehow. He is a kind of new Samantha for both Mulder and Scully. Already in My Struggle, Sveta mentions Scully and Mulder had a child. I expect him to be referenced extensively in My Struggle II but not appear physically until a sort of series finale (or third movie).